Your avocado pit has germinated successfully with the help of your AvoSeedo and before you know its a little avocado tree of between 15cm and 30cm in height has arisen before your eyes. This means it’s time for your tree to start growing in proper soil. The avocado tree is a tropical plant. It is unsuited to grow outside in cooler climates where the temperature is likely to drop below 10 degrees Celsius. Individual growers from colder climates should plant their avocado tree in a pot and move it around to ensure optimal exposure to favourable climatic conditions. If your avocado tree is going to grow in a pot all its life, choose a 15 gallon pot with drainage holes in the bottom right from the start. Terracotta is a good choice. Good drainage is key to good growth. Avocado trees have a relatively shallow root system. If fully saturated for more than two days, the roots will rot and the plant will die. Loose and sandy, but fertile soil that provides excellent drainage is important. Ask for a light potting soil, like a mix for cactuses, at your garden centre. To help drain excess water away, you can also lay some stones at the bottom of the pot before filling it up with soil. Carefully remove the little tree from the AvoSeedo when your pot is ready. Untangle the roots if necessary. Now make a hole big and deep enough for the avocado pit and its roots to fit in. Spread the roots out as much as possible. Fill the hole in, packing the soil lightly around the pit. Leave the top half of the pit open to prevent the base of the seedling trunk from rotting under the soil. 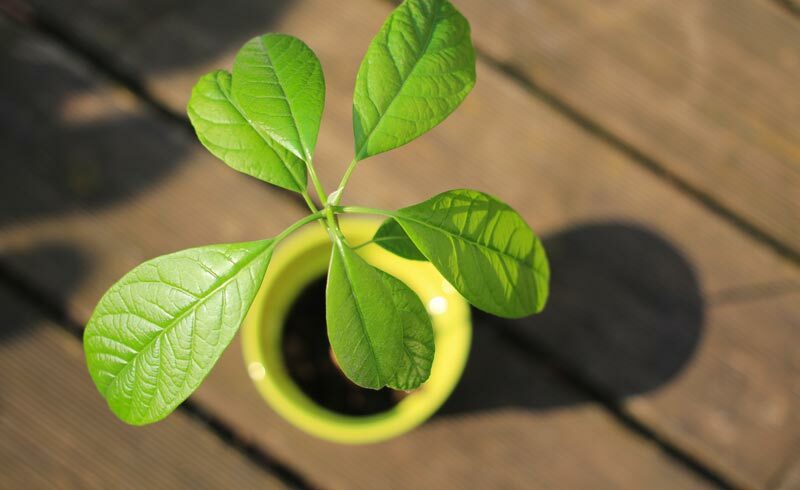 The correct amount of watering and lots of exposure to sunlight are the two most important factors to ensure the successful growth of your potted avocado tree. As mentioned before, over watering can kill an avocado tree. Invest in a moisture gauge or poke your finger into the soil. If it feels dry and crumbly, it’s time to water again. The color of the leaves is also a good indicator of moisture levels. If the leaves turn yellow, the tree is getting too much water. If they turn brown at the tips, it’s probably thirsty. Not much fertilization is needed in the first year. After that a balanced fertilizer like a 10-10-10 is recommended twice a year. When the plant grows to about one foot tall, trim it to half its size. This will encourage a rounder, fuller plant. Annual pruning just before the spring growth spurt is recommend afterwards. This entry was posted in All about Avocados, Gardening and tagged avocado in pot, plant pot, planting, pot, trimming.